Word, Excel, and PowerPoint may get all the attention, but OneNote has quickly become the gem of the Microsoft Office suite. Microsoft is now extending the reach of OneNote with an app for Android smartphones and tablets. 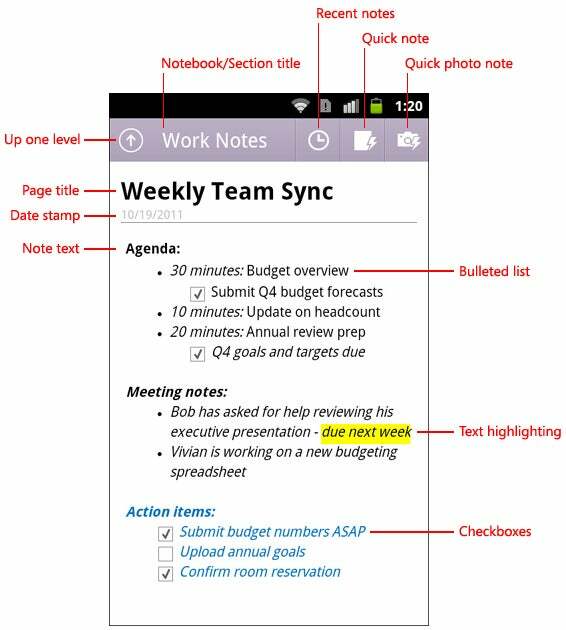 A breakdown of key features of the OneNote Mobile for Android app. The Android app further extends the reach of OneNote. It is already part of the Windows version of the Microsoft Office suite, and it is available on Windows Phone, iPhone, and on iPad. OneNote is arguably the most versatile product in the Microsoft Office lineup. You can make lists, track to-dos, take notes, organize information. You can also use it to manage projects and collaborate with others by sharing out notebooks you create. Whether you use OneNote personally, or as a project management or collaboration tool with others, the addition of the Android app is welcome. Many people have Windows PCs, an Android smartphone, and an iPad, or some similar cross-platform collection of devices. The value of OneNote is in being able to create, access, and edit the information contained in OneNote no matter what platform you are using at the time. Like the iOS version, OneNote Mobile for Android is offered for free from Microsoft, but has a maximum limit of 500 notes. Once you hit the max, you will have to purchase the unlimited version for $4.99 or you will no longer be able to create or edit notes from the Android app. You will, however, still be capable of syncing and viewing the notes you have created on other platforms. The primary competition for OneNote is Evernote. Evernote has OneNote beat in the diversity of platforms it is available for -- but not by much now that Microsoft has an Android app for OneNote. Each has its pros and cons. I urge you to check out our head to head comparison, Evernote vs. OneNote: Note-Taking Apps Showdown.